This is Not Where I Thought I Was Going > Uncategorized > Published! Free on Kindle Thanksgiving Week. And just like that, I’m an author. 199 words on gratitude just got me published in an eBook on Amazon. I downloaded and read a copy last night. Over 100 writers contributed essays, and I am thrilled to be included! I’m also pleased that the book includes links to charitable causes that we authors support. There are a number of worthy organizations at the back of the book. It was a big deal to read the first published book containing my work on the Kindle! I am so blessed to be included. 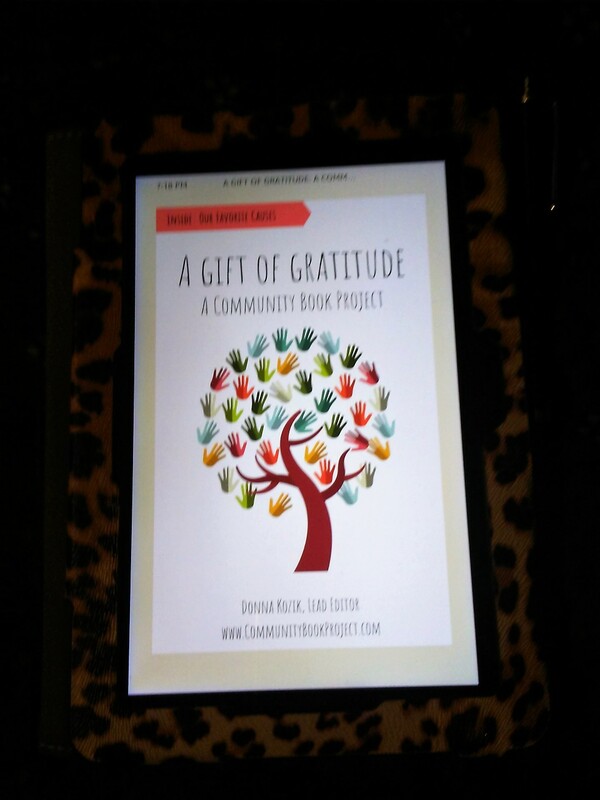 Donna also heads up The Community Book Project, and she issued an invitation to submit a 200 word essay for the 3rd book in the series. The subject was to be gratitude – and that’s a natural for me! If you follow me on Facebook you know that I post each evening about at least 3 things that I have been thankful for that day. Sometimes they are big things, but often they are very small. Very often I’m thankful for something related to nature, like the turning of the fall leaves, or the honking of migrating geese. I began the daily practice gratitude during my time as a student at Wilderness Awareness School, and that’s the nonprofit I chose to feature. That’s where I learned the Thanksgiving Address – the topic of my essay. The profound book, “One Thousand Gifts”, by Christian writer Ann Voskamp lead to me keeping a list and I started putting it on my Facebook page to share with friends. Long ago I lost count, so now I just use the * symbol. I’ve been surprised and humbled to hear that people I don’t even know check to see what I’m thankful for each day. One thing I’m thankful for is the opportunity to lift spirits and to remind people to look for the good. When we concentrate on the bad things we only see the bad. And there’s so very much to be grateful for! This little book contains some real gems, and I hope you will enjoy it. As I write this on Sunday evening, November 18, 2018 it’s listed at .99 cents. You can pick up a free copy during Thanksgiving week (November 19-23) and you don’t even need a Kindle! There’s a free app for your computer or phone that you can download directly from Amazon. And don’t feel guilty for snagging a free copy – the book was a labor of love, and is intended as a gift to all.